I’ve been into mindfulness for a long time but having never been much of an artist, the mindfulness coloring craze had bypassed me until recently. I brought a book and some colored pencils to keep me amused during a recent train trip but enjoyed it so much I’ve continued the habit—and to my surprise, the work I’ve done looks quite good! 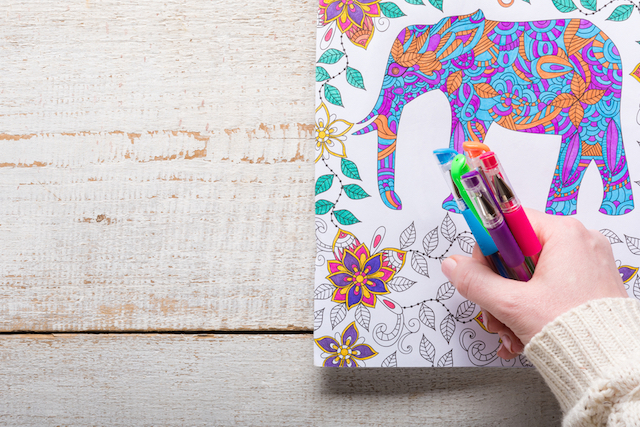 I’d heard that mindful coloring is good for reducing stress levels and being more present, but I found even more benefits. For example, after coloring I noticed that I had flashes of inspiration and ideas that seemed to come out of nowhere for someone not usually known for their creative genius. 1. We create what we envision. Life is a blank canvas; we make it what we want it to be. Like the pages of my coloring book, each new day is blank with potential and possibility, and I get to choose what colors I use, how, and when, and the attitude with which I approach the page or the day. I can spend the day creating amazing colors and fulfilling my potential, or I can complain about the blunt pencils, going out of the lines, and the many other things that may not be going right. 2. We’re all capable of creating beauty. We are all capable of creating beauty, even if we think we can’t draw. I’ve spent many years believing I’m no good at art, but this has showed me I am still able to create pretty pictures, despite not being ‘an actual artist’! The same is true of other roles we might want to try in life. We might think we’re not writers, or chefs, or enterpreneurs—but we can do more than we think, if only we’re willing to try. We can create something beautiful if we’re willing to see ourselves in a new light. Mindful coloring has taught me to let go of perfection and unrealistic expectations of myself. Like life, my drawings don’t have to be perfect. It’s okay if I go out of the lines; mistakes are just bends in the road, not the end of the road. And if I’ve really messed it up I turn the page and start again. On the flip side, when it goes right I’ve learned to take a moment to savor this and appreciate the beauty. Sometimes in life, whether it’s on the page and our own creation or out in the world and a natural phenomenon, it’s nice to stop for a moment and appreciate what we’ve done. 4. Good maintenance increases effectiveness. The second investment I made after my coloring pencils was a sharpener. I realized you can’t draw nice pictures with blunt pencils, and keeping the implements in good shape is critical for effective results. The same is true for ourselves; looking after our bodies and minds and prioritizing self-care allows us to perform at our peak. Whatever you do in your personal or professional life, you’ll be far more effective if you exercise regularly, eat nutritious meals, recharge through contemplative practices like yoga and meditation, and get sufficient sleep. 5. Doing things we love isn’t wasting time. Mindful coloring has taught me the importance of finding time to do what we love. Most people look at me funny when I say I’ve been coloring, almost as if I must have nothing better to do and am clearly not busy enough doing ‘important things’ like other grown ups. It’s important that we have downtime and make time not just to do the things we love, but to play and flex our creative muscles as well. For me, that’s coloring; for you, that might be dancing, playing in a band, or riding your bike. 6. We’re never too old to play. The misguided belief that coloring is for kids or that there are much more pressing things to spend our time on made me realize the importance of play. I hadn’t colored since I was a kid. In our grown up world of busyness we have overlooked the importance of keeping in touch with our inner child, and this is how life can get dull and boring. Not only does play keeps this interesting, it also relieves stress, boosts creativity, and can even improve brain function. 7. Less doing, more being. Most of all, mindful coloring has showed me the art of less doing and more being, which is crucial in a world of overstretched, exhausted adults. Mindfulness itself in any form is fabulous for returning us to the present and making us more aware. We can spend so much time going over the past or worrying about the future that we miss the present, and this is of course our lives—the moments we are in now. It’s too easy to let life pass us by. Mindful activities give us the opportunity to be more present. I would never have thought something as simple as coloring could have brought me so much insight and joy. Life is a lot like that—we never know what will enrich our lives until we give something a try. So go out there and create, and don’t worry about making it perfect. Just throw yourself into it and enjoy the process. And let yourself go out of the lines every now and then. Sometimes mistakes can be beautiful—and if not, you can always turn the page!